About the Book: Eleanor and Park are both misfits. When new girl Eleanor sits next to Park on the bus, they don't want anything to do with each other. But over the course of the school year, things change. It starts with comic books and becomes a friendship and a romance that the two will never forget. You never forget your first love. GreenBeanTeenQueen Says: Have you ever had a book sit on your shelf that you've heard so much hype about? And you think that books sounds like it would be right up your alley, but you're in a reading slump and you're afraid to give it a try unless it fails? 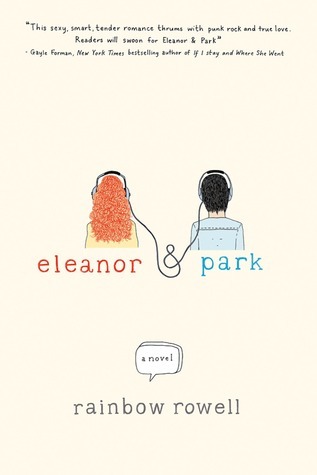 I knew Eleanor and Park sounded like my perfect book, but I was in such an after committee slump that I even though I knew this book would help, I just didn't want to be disappointed. I should have known better because Eleanor and Park was perfect and everything that I had hoped it would be. I know many readers will focus on the romance aspect of the story and point out that this is a love story. Yes, it is, but it's also so much more. It's a beautiful and heartbreaking story of friendship, family, and coming of age. So much of the novel is about Eleanor and Park, obviously, but there are so many fantastically written storylines all packed in to make this book really stand out. Eleanor feels as though she doesn't fit in. But part of me wonders how much of her not fitting in is because she doesn't know how or doesn't even want to fit in. I think part of her kind of likes being different. She's made fun of at school and is being bullied by a mean girl at school, but there's also part of Eleanor that is judging the people around her just as they are judging her. There is a very strong element of not really knowing someone just from outward appearances that runs deep throughout the novel. Eleanor also find herself jealous of Park's family. Park seems to have a nice, perfect family (on the outside of course) but Eleanor is stuck in a bad situation and she's not sure how to get out of it. Her stepfather is abusive-emotionally, verbally, and physically, and Eleanor wants to escape but feels she's stuck with what she's been dealt and is trying to find a way to live through it. This makes Eleanor and Park's relationship even deeper than first crush-they are saving each other and helping each other through tough situations. Rowell excels at making the reader feel the depth of their relationship and the emotions that Eleanor and Park have for each other. We fall in love along with them and this isn't a simple crush-this is a deep, soulful love that will be felt long after we finish the last page. I also really loved how this was a friendship romance. Eleanor and Park's relationship and growth throughout felt real and I as reader felt it as deeply as they did. I felt Eleanor's fear of her stepfather and the situation her family was in. I wanted Eleanor to be able to stand up to the girls at school. I wanted Park to be able to talk to his dad and know he was loved. Rowell excels at really pulling the reader into the story and making them feel what the characters are feeling-and it's not sappy or perfect. Eleanor and Park have moments where holding hands and kissing is enough because they care so deeply about each other. This made them feel even more real to me. This is a realistic love story of two misfits who find each other. The ending was absolutely perfect and I couldn't have asked for a better way to wrap things up. While the book is set in 1986, the pop culture references work well and I didn't feel like they distracted from the story. It fit-Park and Eleanor's love of comics and music and making mix tapes-it fit their characters and wasn't thrown in just to have a reference from something in the 80s. I also loved setting the story in 1986 because it took out any electronic connection and simplified things which really worked well for the dynamic of the story. Believe the hype because Eleanor and Park is every bit as amazing and wonderful and beautiful and emotional as I thought it would be. Put this one to the top of your reading pile! Love this review completely agree! Such a a great book! I've been seeing this book around a lot and I really want to pick it up & devour it because it sounds adorable but I'm a little scared for the not so happy ending. Though I'm glad you loved it. Now, I have to read it too :) Great review! I was worried about the ending too, but I found it to be perfect. I absolutely adored this book-such a fantastic read and a great introduction to Rowell's writing. You should definitely check out Attachments and Fangirl if you haven't already. I've read Attachments and it's adorable-loved it so much! I need to read Fangirl. I'm a fan of her writing for sure!